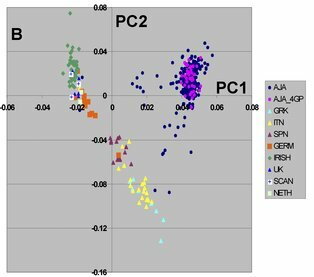 "This SNP study (and others) also shows that Ashkenazim are genetically distinct from other Europeans, which allows fairly accurate identification of group membership. Almost perfectly distinct, if you look at Ashkenazim whose grandparents are all Ashkenazi (the violet dots)." The violet dots that cluster in the upper right amidst purple dots are Ashkenazi [Northern European] Jews with four Ashkenazi grandparents. The more scattered purple dots are self-identified Ashkenazi Jews with more mixed pedigrees. The green dots in the upper left corner are Irish (this may be the first racial graph I've seen in years where the color coding wasn't intentionally randomized) and the light blue dots at the bottom are Greeks. I don't know what the two axes are—factor analysis is a creative tool, in which you've got to come up with the insights. The statistical mechanics won't do it for you.